"Crash for cash" insurance scams have continued to rise to a record level, according to one of the UK's biggest motor insurers. These incidents involve an induced crash by criminal gangs in order to claim compensation for whiplash. Aviva said there had been a 21% rise in this organised fraud so far this year, compared with 2013. It believes the greatest number of incidents are in Birmingham, Luton and North London. Aviva had previously warned that these incidents were on the rise throughout 2013. 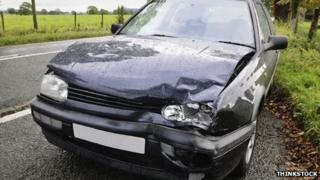 It said the cost of fraudulent claims was borne by other motorists, adding an estimated £14 to the typical annual motor insurance policy. It also said there were wider implications for those who were innocently involved in these accidents. "Crash for cash is not just a financial problem, it is a serious social problem," said Tom Gardiner, of Aviva. "No other form of insurance fraud puts the public at risk of serious injury." The insurer wants the government to change the rules so minor whiplash claims are compensated with rehabilitation, rather than cash.